A woman in Virginia was reported killed early Monday as strong storms, including tornadoes, swept through parts of the U.S. Midwest and the mid-Atlantic region after wreaking havoc in the South over the weekend. The Stafford County Sheriff's Office said in a news release a 78-year-old woman died after a tree fell on her residence at 1:43 a.m ET. Stafford County is about an hour south of Washington, D.C.
An 82-year-old man at the residence was taken to hospital with injuries that were not life-threatening. Both the man and the woman were asleep at the time of the incident. Storms that hit Ohio and Pennsylvania on Sunday and moved into New Jersey overnight brought heavy rains, lightning and strong winds. In Shelby, Ohio, the U.S. National Weather Service said a tornado touched down Sunday. 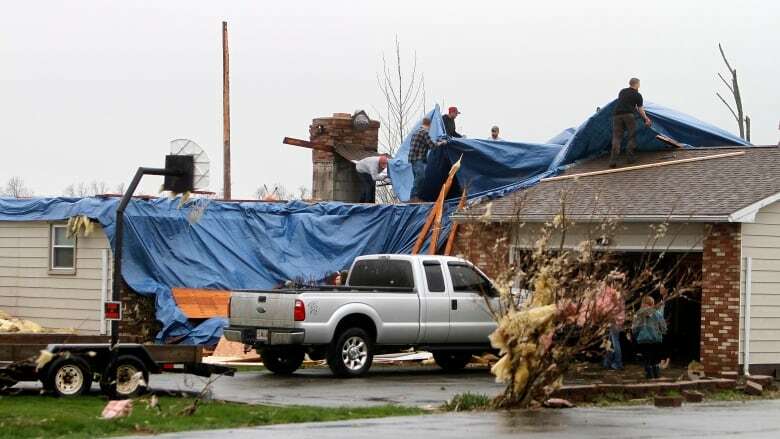 No deaths were reported, but Richland County emergency officials said that about a half-dozen homes and businesses were damaged and that at least six people were injured in the city roughly 145 kilometres southwest of Cleveland. Forecasters also said a twister touched down in Starbrick in Warren County's Conewago Township in northern Pennsylvania just before 8:30 p.m. local time Sunday, causing significant damage to a lumber company. A local television station reported that the roof of the Carter Lumber Co. blew off and mangled pieces of metal littered the road. 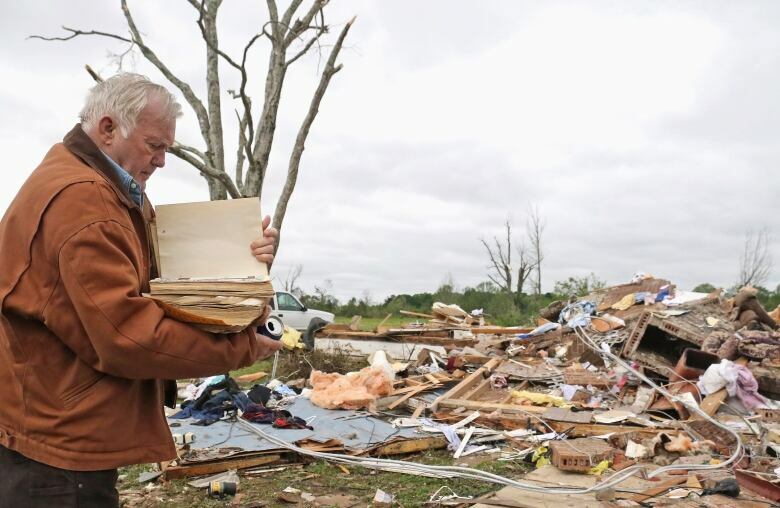 The National Weather Service said more than a dozen tornadoes have been confirmed in the South after a weekend of violent weather that left at least eight people dead. The numbers could go up because teams are still assessing damage, officials said. One of the deaths in East Texas was that of a person initially among at least 25 injured when a tornado tore through the Caddo Mounds State Historic Site during a Native American cultural festival Saturday. Cherokee County Judge Chris Davis said the woman died of her critical injuries. In neighbouring Houston County, the sheriff's office has confirmed one person was killed in Weches, some 10 kilometres southwest of Caddo Mounds. In Louisiana, an Ouachita Parish Sheriff's Department spokesperson said Sunday that two people died in floodwaters Saturday. Sebastian Omar Martinez, 13, died during flash flooding in the community of Bawcomville, near Monroe. Responders pulled him from a drainage canal. Several hours later, a person died in a submerged vehicle near Interstate 20 in Calhoun. A county employee in Alabama died after being struck by a vehicle while he was helping clear away trees toppled by the storm. Capt. David Agee of the Jefferson County Sheriff's Office said the worker was struck about 2:15 a.m. Sunday near in the Birmingham suburb of Hueytown and died after being taken to hospital. His name was not immediately released. The first deaths were reported in Texas — where two children were killed when a tree fell on a car in which they were riding in Lufin, about 185 kilometres northeast of Houston — and in Mississippi, where a 95-year-old man was killed when a tree fell on his trailer in the town of Hamilton. Multiple people were reported injured along the Mississippi-Alabama state line late Saturday and early Sunday, and about 65,000 homes and businesses were without power at one point in Louisiana, Mississippi and Alabama.